Quality, Safety, Technological Innovation, Competitiveness, Respect for the Environment – these are the characteristic objectives of Armesa Logística company policy. Such aims have made Armesa Logística one of the best international land-based transportation companies, awarded the GEA, Chamber of Commerce and Siemens-VDO prizes. Armesa Logística maintains its commitment to quality control and safety, which have characterised the company ever since its inception. 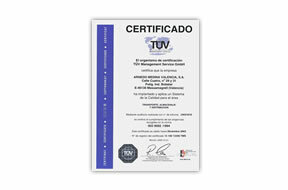 The efficacy of Armesa Logística’s management processes is reflected in the certificacions of the environmental quality system according to the ISO 9001, IFS Logistics and QS Logistics. In Armesa Logística, we make constant improvements aimed at achieving excellence in our systems of international land-based transportation management. This allows us to provide a better service and helps protect the environment, the ultimate target in our day-to-day operations. Sustainability and Respect for the Environment. Armesa Logística is committed to protecting the environment. Our land transportation fleet is equipped with advanced EURO VI low-consumption engines, with limited air and noise pollution. Armesa Logística renews its transport fleet every 12 months in order to guarantee the safety of its professional workforce. A modern land transport fleet always in perfect condition allows us to arrive just in time and hand over the cargo to the recipient in a perfect state. Armesa Logística is committed to technological innovation which improves the quality of the service offered to our clients. The Transics Wabco Company tool is perfectly integrated into the company, resulting in greater control and improved resource allocation. Permanent annual renewal and setup adjustment provide the fleet with the safety and reliability it needs. Given that greater competitiveness is achieved through striking a balance between quality, innovation and price level, Armesa Logística makes a firm effort day-to-day to compete in the international land-based transportation market in a fair manner, respecting current laws and regulations, internally implementing the necessary controls for the prevention of inappropriate conduct. In addition, it uses a partnership policy targeting an improved quality-price ratio which in turn is of great benefit to final consumers of the products it transports.